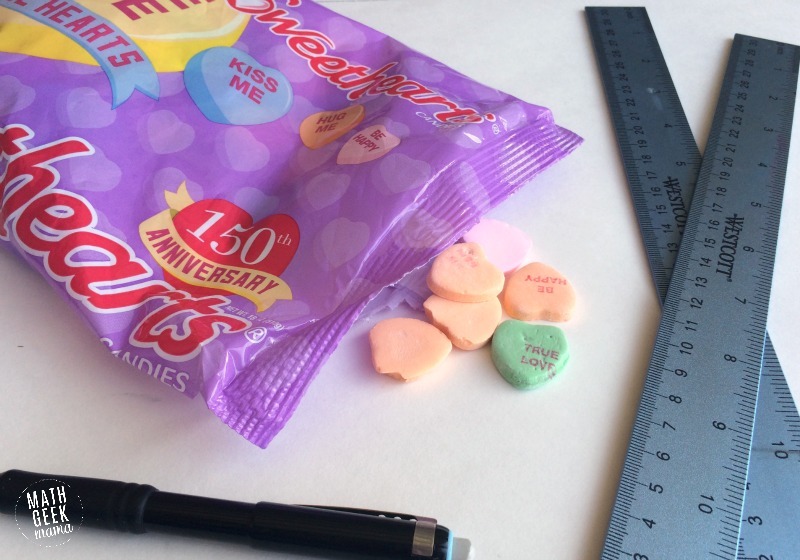 I love getting my kids excited about using and learning math, and so we recently used a bag of conversation hearts to explore patterns, estimation and measurement, as well as introduce some engineering ideas! 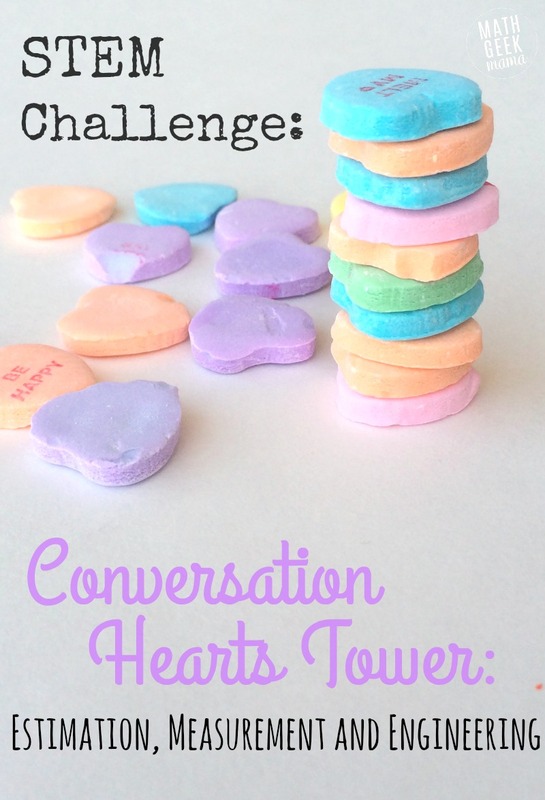 I was amazed at the conversations and ideas we explored as they attempted to build a tower with conversation hearts. They’re so much more creative than I am, and had so many great ideas! The first thing I did was explain the task to my kids (ages 6 and 7). They were immediately excited at the challenge! 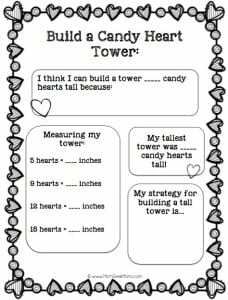 But before they started, I had them look at the hearts, measure them and estimate how tall they thought they could make their tower. 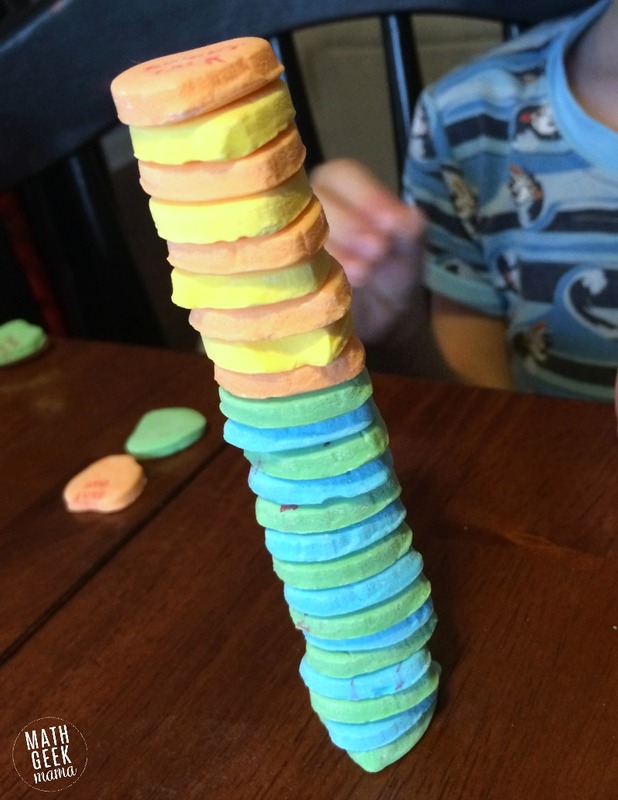 I also demonstrated it for them and let them base their estimate on my small tower, which was 10 hearts tall. After seeing mine, their estimates were 14 and 15 hearts tall. Then I let them play and build! I was so impressed that they were focused not only on building their tower and counting the hearts, but also making various patterns. They loved trying different patterns, sometimes using all the colors, sometimes just 2 or 3. I let them experiment a few times first, then we would occasionally stop and measure their creations. This was great practice for them, as well as a chance to talk about the different units of measurement on our ruler (inches and centimeters). After some trial and error, they began to look for ways to make their tower sturdier, so that it could be taller. Our results? 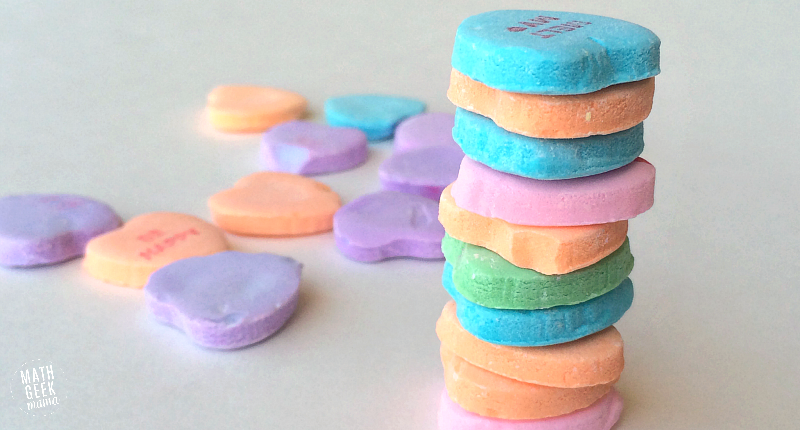 The tallest tower built was 30 candy hearts tall! (Unfortunately it fell at heart 31 and I didn’t get a picture). We also measured some of the taller towers to be around 4-5 inches tall, but this was before they got to the tallest point. 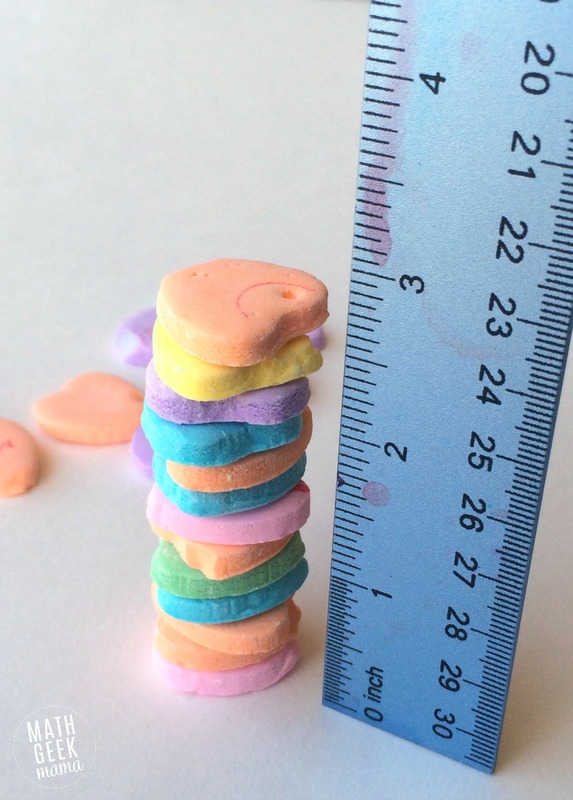 And if you’d like a simple recording page for kids to keep track of their estimate, actual candy count, as well as measurements, click the link below! Did you enjoy this post? 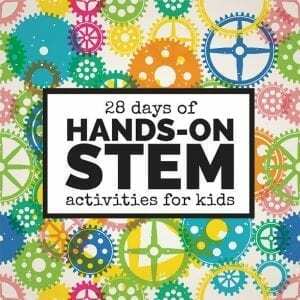 It is part of the 28 Days of STEM series at Left Brain Craft Brain, where bloggers are sharing all kinds of fun STEM learning ideas for the entire month! Be sure to head over there to find more ideas! Which Cup Holds the Most Hot Chocolate? Love how simple this one is! Such an easy way to incorporate STEM into the every day! Thanks for sharing at the Thoughtful Spot! 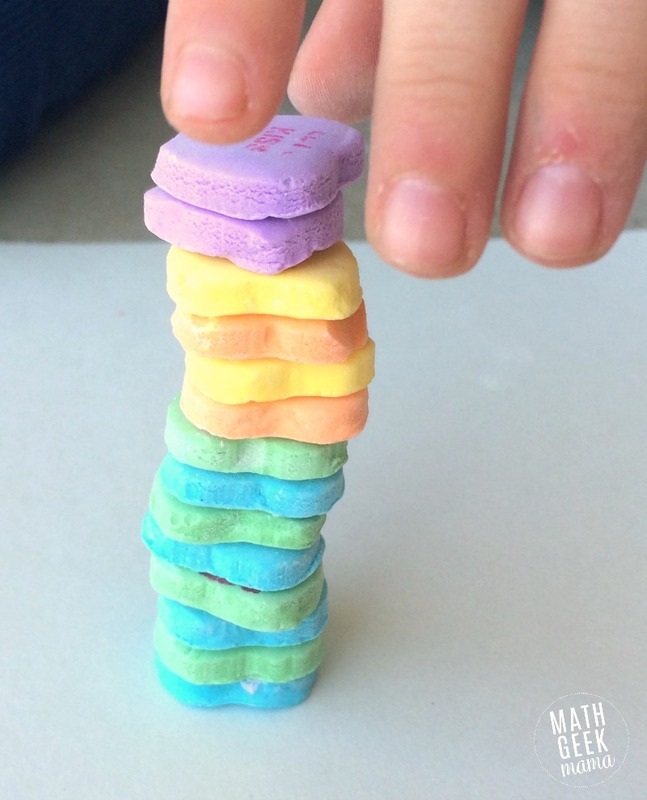 I love hands on math. I am always looking for ways to make math more fun :). Thank you for the free printable I look forward to using it with my boys.